Founded in Jin dynasty, Taohuayuan had reached its peak in the Song dynasty (song 宋). It is one of the China's four major Taoist sacred places, sharing the same praise with Emei (é méi 峨眉), Wudang (wǔ dāng 武当) and Nanyue (nán yuè 南岳). From time immemorial, it has had the reputation of the thirty-fifth dwelling of immortals and the forty-sixth blessed spot, harmonized the culture of Nuo (nuó 傩), Taoism, Buddhism, Confucianism and other multi-cultural. It is the product of Chinese history and culture change as well as the vicissitudes of life, and also witnessed the seclusion culture to the world. Taohuayuan represents a dimension of Chinese history and culture, having a very high visit, historical value and cultural artistic value, which flickers the light of human civilization. Taohuayuan, a national AAAA scenic spot, is located in the southwest of Taoyuan County (táo yuán xiàn 桃源县), 23km away from Changde (cháng dé 常德), northwest of Hunan Province (hú nán shěng 湖南省). 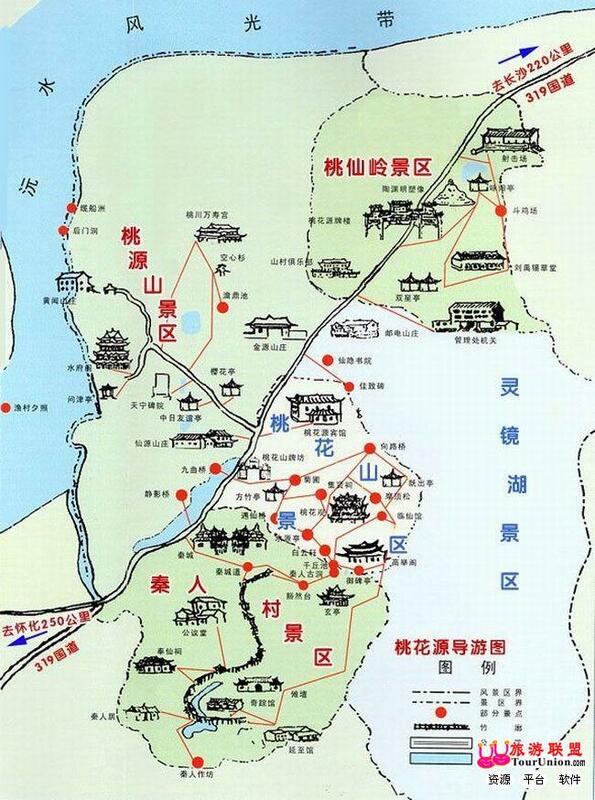 Taohuayuan covers a total area of 157.55 square kilometers, of which the core scenic area of 8.12 square kilometers. There are myths hometown Taoxian Ling (táo xiān lǐng 桃仙岭), Taoist Holy Land Taoyuan Hill (táo yuán shān 桃源山), blessed cave heavens Peach Hill (táo huā shān 桃花山), paradise Qin village (qín rén cūn 秦人村) of four scenic areas nearly 100 visiting spots. 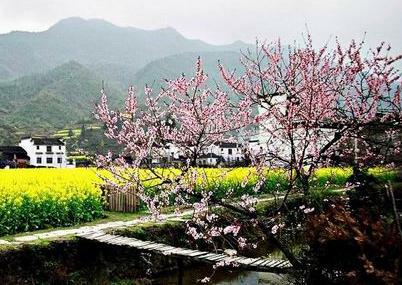 The Peach Hill and the Qin village are the center of the Taohuayuan Scenic Area. 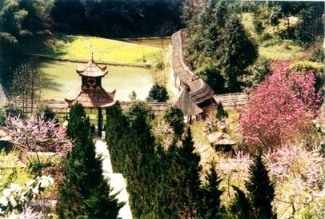 There are more than 70 tourists attractions, such as the Peach Hill Arch (táo huā shān pái fāng 桃花山牌坊), the Peach Blossom stream (táo huā xī 桃花溪), peach forest (táo shù lín 桃树林), Qionglin Bridge (qióng lín qiáo 穷林桥), garden of chrysanthemum (jú pǔ 菊圃), Fangzhu Pavilion (fāng zhú ting 方竹亭), Immortal Meeting Bridge (yù xiān qiáo 遇仙桥), the Pavilion of riverhead (shuǐ yuán tíng 水源亭), the ancient cave of people in Qin dynasty (qín rén gǔ dòng 秦人古洞), Yanzhi Hall (yán zhì guǎn 延至馆) and Jixian Temple (jí xián cí 集贤祠). Fronting water and with a hill at the back, the scenic area has a dense growth of evergreen trees and peach blossom trees and formed a "retreat away from the world". 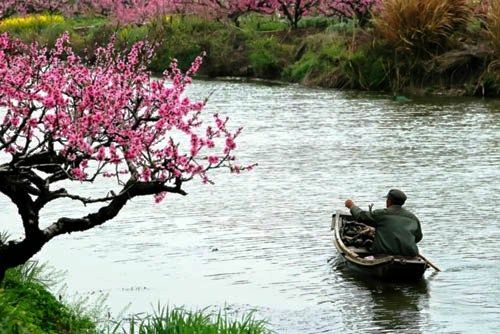 Coming when the peaches in full blossom, travels can check out the trees of flourishing flowers everywhere crowding like the peach blossom cloud. Red alternating with white, some flowers are coceine as rouge, while others are white as jade. Extending from the area is the extraordinary landscape where the grandeur of Mount Wuling (wǔ líng shān 武陵山), the quiet cave and valleys, the rolling water of Dongting Lake (dòng tíng hú 洞庭湖) and the grace of mountains and rivers in Hunan are well-blended, presenting people with the fascinating Peach Blossom Land. Moreover, there is one of the Eight Grand Sights (xiāo xiāng bā jǐng 潇湘八景) in Hunan Province, known as "Fishing Village at Sunset (yú cūn xī zhào 渔村夕照)" among the scenic area together with the landscape of Yuan River (yuán jiāng 沅江), the historical ruins of Cailing Castle during the period of Warring States (zhàn guó cǎi líng chéng yí zhǐ 战国采菱城遗址) and Xinde Mountain (xīng dé shān 星德山), etc. Taohuayuan took on the meaning of Utopia for hermit's place because of Tao Yuanming's extraordinary prose. 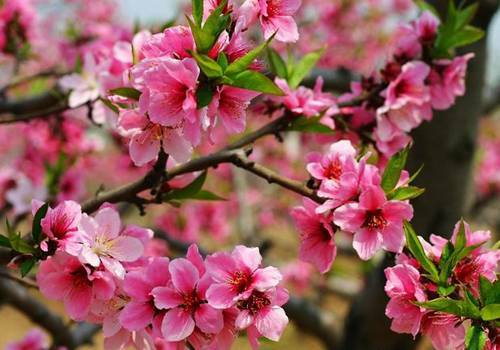 Since then thousands of scholars and celebrities of all dynasties went to visit the place and every year the Peach Blossom Watching Festival is held here with a huge social gathering. 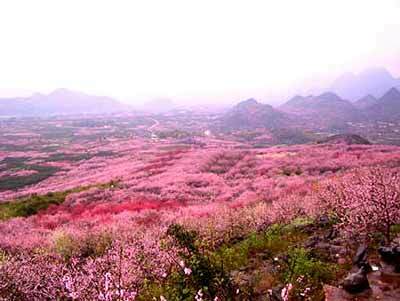 Peach trees are everywhere in the scenic area and blossoms come into bloom in late March to late April every year. It is just like a picture of rural scenery and a land of peace, away from the turmoil of the world. Opening Hours: 8:00 a.m. - 4:00 p.m.
You can take bus at the Changde South Station to Taoyuan North Station (an hour, CNY 6.5) and then transfer the bus to Taohuayuan (half an hour, CNY 3).